OPTIC indicates Optimal Pharmacological Therapy in Cardioverter Defibrillator Patients. Log-rank P<.001 for amiodarone plus β-blocker vs β-blocker alone, log-rank P=.02 for amiodarone plus β-blocker vs sotalol alone, and log-rank P=.055 for sotalol vs β-blocker. Antiarrhythmic Drugs for All Patients With an ICD? Context Implantable cardioverter defibrillator (ICD) therapy is effective but is associated with high-voltage shocks that are painful. Objective To determine whether amiodarone plus β-blocker or sotalol are better than β-blocker alone for prevention of ICD shocks. Design, Setting, and Patients A randomized controlled trial with blinded adjudication of events of 412 patients from 39 outpatient ICD clinical centers located in Canada, Germany, United States, England, Sweden, and Austria, conducted from January 13, 2001, to September 28, 2004. Patients were eligible if they had received an ICD within 21 days for inducible or spontaneously occurring ventricular tachycardia or fibrillation. Intervention Patients were randomized to treatment for 1 year with amiodarone plus β-blocker, sotalol alone, or β-blocker alone. Main Outcome Measure Primary outcome was ICD shock for any reason. Results Shocks occurred in 41 patients (38.5%) assigned to β-blocker alone, 26 (24.3%) assigned to sotalol, and 12 (10.3%) assigned to amiodarone plus β-blocker. A reduction in the risk of shock was observed with use of either amiodarone plus β-blocker or sotalol vs β-blocker alone (hazard ratio [HR], 0.44; 95% confidence interval [CI], 0.28-0.68; P<.001). Amiodarone plus β-blocker significantly reduced the risk of shock compared with β-blocker alone (HR, 0.27; 95% CI, 0.14-0.52; P<.001) and sotalol (HR, 0.43; 95% CI, 0.22-0.85; P = .02). There was a trend for sotalol to reduce shocks compared with β-blocker alone (HR, 0.61; 95% CI, 0.37-1.01; P = .055). The rates of study drug discontinuation at 1 year were 18.2% for amiodarone, 23.5% for sotalol, and 5.3% for β-blocker alone. Adverse pulmonary and thyroid events and symptomatic bradycardia were more common among patients randomized to amiodarone. Conclusions Despite use of advanced ICD technology and treatment with a β-blocker, shocks occur commonly in the first year after ICD implant. Amiodarone plus β-blocker is effective for preventing these shocks and is more effective than sotalol but has an increased risk of drug-related adverse effects. The implantable cardioverter defibrillator (ICD) reduces mortality in patients at risk for sustained ventricular arrhythmia,1,2 primarily by delivering high-voltage shocks that terminate potentially fatal ventricular arrhythmias. ICD shocks are painful and patients may receive multiple ICD shocks. Such experiences are unpleasant and may lead to premature battery depletion.3 In addition to shocks for ventricular tachycardia (VT) and ventricular fibrillation (VF), which the device is designed to treat, inappropriate ICD shocks may occur in response to atrial arrhythmias. Modern dual-chamber ICDs have antitachycardia pacing therapy that may terminate some episodes of ventricular arrhythmias without the need for a shock, and discrimination algorithms to reduce the risk of inappropriate shocks. However, ICD shocks, both appropriate and inappropriate, continue to present a problem in the treatment of patients with ICD. Antiarrhythmic drugs such as amiodarone and sotalol have the potential for reducing both appropriate and inappropriate shocks, but their relative efficacy to prevent shocks compared with standard therapy with a β-blocker is unknown. Amiodarone has multiple electrophysiological effects4; however, despite decades of use, it has never been compared with β-blockers in a randomized controlled study in patients with sustained or inducible VT or VF. Sotalol is a β-blocker that also lengthens action potential duration by potassium channel blockade.5 One randomized controlled trial6 reported that sotalol reduced ICD shock risk. However, another smaller study7 reported that sotalol was less effective than a regular β-blocker. Our goal was to compare both amiodarone (administered with a β-blocker) and sotalol with standard β-blocker therapy for prevention of ICD shocks in patients with spontaneous or inducible VT or VF, receiving a dual-chamber ICD. Patients were recruited from 39 out-patient ICD clinical centers at participating hospitals located in Canada, Germany, United States, England, Sweden, and Austria, from January 13, 2001, to September 28, 2004, and were eligible if they had received a St Jude Medical dual-chamber ICD within 21 days before randomization. No screening logs were recorded. Patients had to have sustained VT, VF, or cardiac arrest (not within 72 hours of acute myocardial infarction) and a left ventricular ejection fraction of 40% or lower, inducible VT or VF by programmed ventricular stimulation with a left ventricular ejection fraction of 40% or lower, or unexplained syncope with VT or VF, inducible by programmed stimulation. Patients were excluded if they had long QT syndrome, corrected QT interval of more than 450 milliseconds (if there was a bundle-branch block, the upper limit of the corrected QT interval could be 480 milliseconds), were receiving a class I or class III antiarrhythmic agent, had received amiodarone or sotalol for more than 20 consecutive days at anytime (patients who had received >10 days of amiodarone had to be taken off amiodarone for 10 days before randomization), a calculated creatinine clearance of less than 30 mL/min (<0.50 mL/s), symptomatic atrial fibrillation likely to require use of a class I or class III antiarrhythmic agent, absence of structural heart disease, contraindications to amiodarone or a β-blocker, or New York Heart Association class IV symptoms of heart failure. All centers received ethics committee approval before study initiation and all patients signed written informed consent to participate in the study. Eligible consenting patients were registered and allocated to open-study treatment via a call to an automatic computer-based system at the study's Coordinating and Methods Center in Hamilton, Ontario. The concealed treatment allocation (ratio 1:1:1) was based on a predetermined random sequence incorporating random block sizes of 3 and 6, with stratification for center and the rate of the slowest documented VT (>150/min). Patients randomized to receive a β-blocker could receive metoprolol (recommended dose of 100 mg/d), carvedilol (recommended dose of 50 mg/d), or bisoprolol (recommended dose of 10 mg/d). Patients in the amiodarone plus β-blocker group received 1 of these 3 study β-blockers and, in addition, amiodarone at a recommended loading dose of 400 mg twice daily for 2 weeks, followed by 400 mg/d for 4 weeks and 200 mg/d until the end of the study. The recommended dose of sotalol was 240 mg/d in 2 or 3 divided doses unless the calculated creatinine clearance level was between 30 and 60 mL/min (0.50-1.00 mL/s). In this case, the recommended dose was 160 mg/d. Follow-up via clinic visit for study drug adherence, adverse experiences, and device interrogation occurred at 2, 6, and 12 months following randomization. Recommendations for ICD programming included base rate pacing of 50/min with mode switch turned on. The detection threshold rate for VT was set at a rate of 15/min to 20/min below the rate of the slowest clinically observed VT, up to a maximum rate of 170/min. The upper threshold for use of antitachycardia pacing was 222/min, which was programmed to deliver 4 trains of fixed burst therapy of 10 pulses per burst. The initial burst was delivered at 85% of VT cycle length with 12 milliseconds interburst decrements to a minimum cycle length of 200 milliseconds. The maximum time for antitachycardia pacing therapy before shock therapy was 30 seconds. Sixteen seconds of information was collected for triggered events. Algorithms to prevent inappropriate shocks due to supraventricular arrhythmia were dual-chamber arrhythmia sensing programmed “on,” supraventricular tachycardia upper limit programmed “same as fibrillation,” morphology programmed “on,” sudden onset programmed “on” at 100 milliseconds, and interval stability programmed “on” at 8 milliseconds. Shock therapy was programmed to be withheld for a supraventricular tachycardia for 2 minutes. The primary efficacy outcome for the study was the first occurrence of any shock delivered by the ICD, with the analysis based on intention to treat (patients were included in the analysis even if they never took or stopped the assigned therapy). The on-board device memory recorded atrial and ventricular electrograms around the time of each therapeutic event. These recordings were subsequently adjudicated by a committee blinded to treatment allocation to determine the underlying heart rhythm before the event and the appropriateness of the delivered therapy. Originally, the study was designed with 2 primary hypotheses, each tested with a type I error of 2.5%. These hypotheses were amiodarone plus β-blocker would reduce shocks compared with a β-blocker alone, and sotalol would reduce shocks compared with a β-blocker alone. Due to slower than expected enrollment (270 patients by January 28, 2003), it was clear that enrollment of 700 patients could not be achieved. To improve statistical power, the primary hypothesis was changed to a single hypothesis, without any knowledge of emerging treatment effects. The revised single hypothesis was that treatment with either amiodarone plus β-blocker or with sotalol would reduce the risk of shocks compared with treatment with a β-blocker alone. Based on having a single hypothesis and the observed blinded overall event rate of patients then enrolled in the study, it was estimated that 400 patients would provide 80% power to detect a 33% reduction in the risk of shock. No interim analyses of efficacy were performed. Continuous variables were described as mean (SD) or median (interquartile range) as appropriate, and categorical variables were described as number (percentage). Differences in baseline characteristics were tested by using analysis of variance for continuous characteristics and the χ2 statistic for categorical variables. The primary analysis compared the cumulative risk of shock (Kaplan-Meier plots) between treatments via a log-rank test. Hazard ratios (HRs) and 95% confidence intervals (CIs) were calculated based on the Cox proportional hazards regression model. All analyses were performed by the academic investigators at McMaster University (S.J.C., R.S.R., M.G., K.T.) using SAS version 8 (SAS Institute Inc, Cary, NC). Two-sided P<.05 was considered significant. A total of 412 patients were enrolled and initially began receiving their randomly assigned therapy in the Optimal Pharmacological Therapy in Cardioverter Defibrillator Patients (OPTIC) trial (Figure 1). Fifteen patients were lost to follow-up, 3 of whom (2 assigned to β-blocker and 1 to amiodarone plus β-blocker) had no follow-up beyond randomization and 12 of whom had between 1 and 7 months of follow-up. These patients were included in the analysis up to the point of last contact and then were censored. Median follow-up of all patients was 359 days (interquartile range, 236-367 days). Baseline patient characteristics according to treatment assignment are shown in Table 1. Most patients were men and had a history of myocardial infarction. Spontaneously occurring VT or VF was present in 99 patients (71.7%) who received β-blocker alone, 96 (68.6%) who received amiodarone plus β-blocker, and 99 (73.9%) who received sotalol. The rest of the patients had VT only induced by programmed stimulation. The majority of patients received β-blocker at the time of randomization. Very few patients had received sotalol at the time of randomization. Amiodarone had been used by 4 (2.9%), 10 (7.1%), and 7 (5.2%) patients randomized to β-blocker, amiodarone plus β-blocker, and sotalol, respectively. The mean doses, excluding patients who discontinued therapy, actually received at 2, 6, and 12 months for patients assigned to receive amiodarone were 275, 257, and 235 mg/d, respectively, and for patients assigned to receive sotalol were 183, 186, and 190 mg/d, respectively. The mean doses of patients receiving β-blocker alone at 2, 6, and 12 months for metoprolol were 96, 103, and 104 mg/d, respectively; for carvedilol, 31, 30, and 30 mg/d, respectively; and for bisoprolol, 7, 7, and 7 mg/d, respectively. The β-blocker mean doses for patients receiving amiodarone plus β-blocker at 2, 6, and 12 months for metoprolol were 85, 83, and 83 mg/d, respectively; for carvedilol, 18, 18, and 22 mg/d, respectively; and for bisoprolol, 6, 6, and 6 mg/d, respectively. A significant reduction was observed in the risk of a shock when the 274 patients randomized to either of the 2 active treatment groups, sotalol or amiodarone plus β-blocker, were compared with the 138 patients randomized to β-blocker alone (HR, 0.44; 95% CI, 0.28-0.68; P<.001). Figure 2 shows the cumulative risk of a shock for the 3 different treatment groups. Amiodarone plus β-blocker significantly reduced the risk of shock compared with β-blocker alone (HR, 0.27; 95% CI, 0.14-0.52; log-rank P<.001) and sotalol (HR, 0.43; 95% CI, 0.22-0.85; log-rank P = .02). Although there was a trend, sotalol did not significantly reduce the risk of shock compared with β-blocker alone (HR, 0.61; 95% CI, 0.37-1.01; log-rank P = .055). Table 2 shows observed annual event rates and treatment effects (relative to β-blockers) for the primary outcome and various secondary outcomes. In patients randomized to β-blocker alone, the annual risk of any shock was 38.5%. The annual risk of an appropriate shock (for VT or VF) was 22.0% and the annual risk of an inappropriate shock (mostly for supraventricular arrhythmia) was 15.4%. Both types of shock were significantly reduced by amiodarone plus β-blocker but not significantly reduced by sotalol. Of 31 patients who experienced 1 or more inappropriate shocks, the primary arrhythmia diagnosis was atrial fibrillation in 7 patients, atrial flutter in 3 patients, sinus tachycardia in 9 patients, other supraventricular tachycardia in 11 patients, and T-wave oversensing in 1 patient. 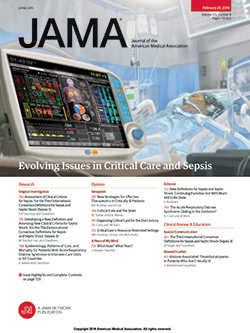 In an analysis that omits both shock events and time at risk in the first 21 days following randomization, treatment effects of amiodarone plus β-blocker and sotalol vs β-blocker alone are somewhat larger and statistically significant, possibly because the analysis omitted unresponsive events during the subtherapeutic period. Table 3 shows the rates at which shocks occurred during follow-up in the 3 treatment groups. Frequent shocks (>10 per year) occurred in 10 patients (7.4%) randomized to β-blocker compared with 2 patients (1.4%) randomized to amiodarone plus β-blocker and 3 patients (2.3%) randomized to sotalol. A first shock followed by a subsequent shock within 24 hours occurred in 14 patients (10.3%) receiving β-blocker, 3 (2.3%) receiving amiodarone plus β-blocker, and 2 (1.4%) receiving sotalol. Table 4 shows reported adverse events for the 3 treatment groups. The mortality rate was low (3.1% per year) and not significantly different between treatments. Of 12 patients who died, 2 were randomized to β-blocker alone, 6 to amiodarone plus β-blocker, and 4 to sotalol. Kaplan-Meier estimates of discontinuation of study treatments at 1 year for any reason were 5.3% for β-blocker, 18.2% for amiodarone, and 23.5% for sotalol. In the amiodarone plus β-blocker group, there were higher rates of adverse thyroid and pulmonary effects and of symptomatic bradycardia. There were no cases of torsades de pointes. In a large randomized trial of patients receiving ICD therapy for secondary prevention of serious malignant ventricular arrhythmias, a combination of amiodarone and β-blocker therapy prevented shocks better than β-blocker alone, although sotalol alone tended to reduce shock rates. Compared with β-blocker treatment alone, approximately 35 patients would need to be treated for 1 year with amiodarone plus β-blocker therapy to prevent a shock occurring in 10 patients. Patients who receive ICD shocks have reduced quality of life. In an analysis of data from the Antiarrhythmics Versus Implantable Defibrillators trial,3 Schron et al report that the occurrence of ICD shocks was associated with reduced physical functioning and mental well-being. Another study reported that patients who have experienced an ICD shock do not adapt well to living with an ICD and are more anxious than ICD recipients who receive no shock.8 In the Canadian Implantable Defibrillator Study,9 patients with ICD experienced improvements in emotional and physical health compared with patients treated with amiodarone. However, the patients with ICD who received 5 or more shocks from their device did not experience improved quality of life. Thus, it is clear that receiving ICD shocks, especially multiple shocks, adversely affects quality of life in ICD recipients. Effective strategies to reduce ICD shocks are desirable. Our goal was to evaluate 2 antiarrhythmic agents commonly used for suppression of ventricular and supraventricular arrhythmias. Because β-blocker therapy is widely used in patients with an ICD for heart failure or cardioprotection postmyocardial infarction, it was practical to treat all patients with a β-blocker and to test the additional effects of amiodarone and sotalol. Because sotalol has considerable β-blocking effect, an additional β-blocking drug was not thought to be required for patients in this treatment group. Subgroup analysis of amiodarone postmyocardial infarction trials has suggested that amiodarone is particularly effective when used with a β-blocker, making evaluation of the amiodarone plus β-blocker combination appealing.10 Doses of study treatments were chosen to conform with standard practice for these widely used agents. Amiodarone has multiple mechanisms of antiarrhythmic action, with clinical activity against both ventricular arrhythmias and supraventricular arrhythmias.4 We found that amiodarone in conjunction with a β-blocker reduces the risk of both appropriate and inappropriate ICD shocks. In addition to its myocardial antiarrhythmic effects, it has a direct effect on the sinus node, reducing heart rate, which also likely helped to prevent inappropriate shocks. All 3 mechanisms of action of amiodarone may have been important in reducing shocks. We enrolled only patients with spontaneous or induced sustained VT or VF, not patients who received an ICD for primary prevention. Patients with primary prevention ICD may have a lower risk of shocks due to ventricular arrhythmia than those enrolled in our study, although they may have a similar risk of inappropriate shocks. One cannot extrapolate from our study that patients with primary prevention ICD would benefit similarly from amiodarone or sotalol. A recent study11 has reported that the use of antitachycardia pacing therapy is effective in controlling some fast VT episodes, at rates up to 250/min. In the OPTIC trial, ICDs were programmed to deliver antitachycardia pacing for tachycardias up to a rate of 222/min, and it is possible that some shocks due to very fast tachycardias might have been avoided by pacing. Amiodarone therapy has well-characterized toxicity, including pulmonary, thyroid, and skin disorders, as well as sinus bradycardia.12,13 We did observe a higher rate of adverse thyroid and pulmonary events, as well as symptomatic bradycardia, among patients assigned to amiodarone. The rates of adverse effects and drug discontinuation with amiodarone in our study were similar to rates previously reported. More than 80% of patients continued treatment with amiodarone during the 1-year follow-up, although it was administered in addition to a β-blocker. Most patients were already taking a β-blocker at the time of enrollment, which would explain the low rate of discontinuation of β-blockers during the study. Decreased quality of life is a major consequence of ICD shocks. However, quality of life was not formally assessed. The effect of therapy on quality of life in this OPTIC trial would likely be determined by the balance of the benefit of shock reduction and the adverse effects of drug therapy. Should amiodarone or sotalol be administered immediately after ICD implantation or some time before a first shock occurs? By delaying therapy, one reduces the risk of drug-related adverse effects; however, this needs to be balanced against the adverse experience of receiving shock therapy. Fourteen patients (10%) receiving β-blocker alone experienced their first shock as multiple (≥2 shocks within 24 hours). On the other hand, a majority of patients did not have a shock in the year of follow-up in this OPTIC trial. Therapeutic decisions should be individualized, taking into account possible improvements in quality of life and small but increased risks of drug-related adverse effects. Corresponding Author: Stuart J. Connolly, MD, Department of Medicine, McMaster University, 237 Barton St E, Hamilton, Ontario, Canada L8L 2X2 (connostu@hhsc.ca). Author Contributions: Dr Connolly had full access to all of the data in the study and takes responsibility for the integrity of the data and the accuracy of the data analysis. Study concept and design: Connolly, Dorian, Roberts, Gent, Fain, Talajic, Hohnloser. Acquisition of data: Connolly, Dorian, Gent, Bailin, Champagne, Talajic, Coutu, Gronefeld, Hohnloser. Analysis and interpretation of data: Connolly, Dorian, Roberts, Gent, Thorpe, Talajic, Gronefeld, Hohnloser. Drafting of the manuscript: Connolly, Dorian, Roberts, Gent, Bailin. Critical revision of the manuscript for important intellectual content: Connolly, Dorian, Roberts, Gent, Fain, Thorpe, Champagne, Talajic, Coutu, Gronefeld, Hohnloser. Statistical analysis: Connolly, Roberts, Gent, Thorpe. Obtained funding: Connolly, Roberts, Gent, Hohnloser. Administrative, technical, or material support: Connolly, Dorian, Roberts, Gent, Fain, Champagne, Talajic, Coutu, Gronefeld, Hohnloser. Study supervision: Connolly, Dorian, Roberts, Gent, Talajic. Financial Disclosures: Drs Connolly, Dorian, and Hohnloser have received research grants from St Jude Medical. As a St Jude Medical employee, Dr Fain is a stockholder in the company. None of the other authors reported disclosures. Funding/Support: This study was funded by St Jude Medical, Sylmar, Calif.
Role of the Sponsor: St Jude Medical contributed in part to the design of the study but was not involved in data collection, management, analysis, or interpretation. The sponsor reviewed the manuscript before submission and made suggestions. OPTIC Investigators: Stefan H. Hohnloser, MD, Dietrich Kalusche, MD, Berndt Lüderitz, MD, Joerg O. Schwab, MD, U. Klein, MD, Sven Reek, MD, Udo Sechtem, MD, K. Seidl, MD, A. Schuchert, MD, Jürgen Tebbenjohanns, MD, J. Brachmann, MD, Thomas Kleemann, MD, Torsten Becker, MD, Klaus Dönges, MD, Laurence D. Sterns, MD, Andrew D. Krahn, MD, Douglas Cameron, MD, Paul Dorian, MD, Iqwal Mangat, MD, Victoria Korley, MD, Stuart J. Connolly, MD, Anthony S. L. Tang, MD, Benoit Coutu, MD, Jean Champagne, MD, Tom Hadjis, MD, Magdy Basta, MD, Teresa K. Kus, MD, Richard A. Leather, MD, Mario Talajic, MD, Bernard Thibault, MD, Marc Dubuc, MD, Pierre Gagné, MD, Laurent Macle, MD, Denis Roy, MD, Francois Philippon, MD, Gilles O’Hara, MD, Marcel Gilbert, MD, Franck Molin, MD, Louis Blier, MD, Martin J. Gardner, MD, Werner Klein, MD, Ole Kongstad, MD, Grahame Keith Goode, MD, Paul R. Roberts, MD, Efrain Gonzalez, MD, Steve Bailin, MD, Pratap Reddy, MD, Larry German, MD, Howard Frumin, MD, Niraj Varma, MD, Sheldon Brownstein, MD, William M. Miles, MD, Roger Freedman, MD, David Steinhaus, MD, Jeffrey Goldberger, MD, Carlos Cuello, MD, Thomas A. Mattioni, MD, David W. Riggio, MD, Marwan Bahu, MD, Renzo Cataldo, MD, Vijendra Swarup, MD, and Stephen Shorofsky, MD.